Around 80% of time in data analysis is spent on cleaning and preparing data for analysis. This is, however, an important task, and is a prerequisite to the rest of the data analysis workflow, including visualization, analysis and reporting. Python and R are considered a popular choice of tool for data analysis, and have packages that can be best used to manipulate different kinds of data, as per your requirements. This book will show you the different data wrangling techniques, and how you can leverage the power of Python and R packages to implement them. You’ll start by understanding the data wrangling process and get a solid foundation to work with different types of data. You’ll work with different data structures and acquire and parse data from various locations. You’ll also see how to reshape the layout of data and manipulate, summarize, and join data sets. Finally, we conclude with a quick primer on accessing and processing data from databases, conducting data exploration, and storing and retrieving data quickly using databases. The book includes practical examples on each of these points using simple and real-world data sets to give you an easier understanding. 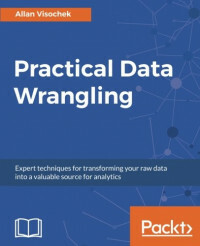 By the end of the book, you’ll have a thorough understanding of all the data wrangling concepts and how to implement them in the best possible way. Allan Visochek is a freelance web developer and data analyst in New Haven, Connecticut. Outside of work, Allan has a deep interest in machine learning and artificial intelligence. Allan thoroughly enjoys teaching and sharing knowledge. After graduating from the Udacity Data Analyst Nanodegree program, he was contracted to Udacity for several months as a forum mentor and project reviewer, offering guidance to students working on data analysis projects. He has also written technical content for LearnToProgram.